hosted it's "World Bazaar"On January 28, 2014 at M Night Club in Honolulu,. 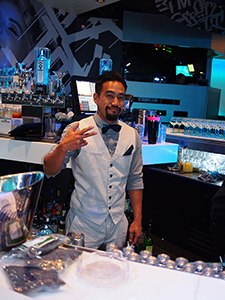 This event featured an "around the world" trip, which tasked bartenders with creating a drink featuring the place of origin for a Bombay Sapphire Botanical. 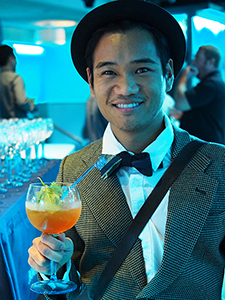 Your Dapper Bartender/Mixologist/Brand Ambassador Tim Rita Jr. was tasked to create an Italian inspired cocktail that featured Bombay Sapphire East, the newest product from Bombay Gin. 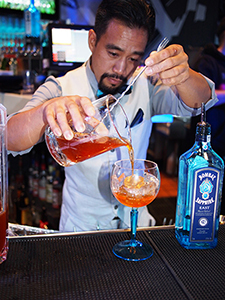 Tim's cocktail, the Shiso Italiano works off The Tuscan Juniper in Bombay Sapphire, and creates a long drink out of a combination between a Negroni and Negroni sbagliato variation. To set off the citrus and prosecco, Tim used Shiso which has the combination of citrus and savory which do well with the Bittersweetness of Carpano Atica Formula Vermouth and Aperol. Build all ingredients in a mixing glass. Then slap one shiso leave to release the oils. Shake and strain into a Collins glass filled with ice. Top with proseco. With a lemon peel "crusta" and a shiso leaf.